The learning advantage of Simulation Powered Learning goes beyond just our award winning simulation. Learning styles, adult learning concepts, team learning, and understanding how the brain works are all learning best practices integrated into Simulation Powered Learning. Visual learners are people who learn best by using their sense of sight. For visual learners SPL classes inc lude colorful materials, graphics in the materials and simulation, and multiple charts for planning and managing their simulation project hanging on the wall. 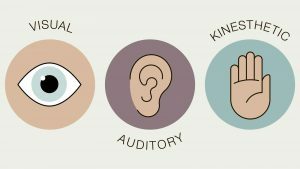 Auditory learners are people who learn best by hearing what they need to learn. For auditory learners SPL classes include interactive discussions, team exercises, and team discussions as they run the simulation and presentations. Kinesthetic learners are people who learn when they are able to physically move or touch the material that is being taught. For kinesthetic learners SPL classes include practical team exercises to create project management tools, planning and managing a real-life project with real life challenges, stakeholders and team members, and creating status and final reports. The David Meier adult learning model tells us that adults learn best when they are asking questions, making mistakes, collaborating, and having fun. In SPL classes our instructors use the Socratic approach, both asking questions and encouraging questions. While working in teams, students question each other. The simulations are designed such that mistakes are inevitable. Instructors don’t call them mistakes, they call them “management challenges you need to overcome” and encourage student teams to turn the mistake into a positive if possible. Teams learn from running their own simulation and from other teams who are running the same simulation while making different decisions and getting different results. The simulations are engaging and challenging and teams compete with each other to create a fun learning environment. SPL classes are designed to maximize learning based on the AGES model. The simulation focuses students on the learning objectives programmed into the simulation while engaging them a realistic and challenging project that raises their emotional levels. The simulation provides the required practice and team member interaction (reflection and thinking) to generate learning. Spacing for retention is achieved by mixing running the simulation with lectures and other classroom activities.